This route is Campground close up at the top of Steve Canyon, just to the right of Super Roof, a classic 5.9 roof crack. To lead Comfortably Numb, besides the usual rigors of protecting the crack, there is a good stretch of unprotected face that would seem problematic. The crack itself goes from about 3.5" to 12" fairly quickly. I would probably plug something like a #4 Camalot in at the start and try to get a deep #6 Wild Country in after getting established in the squeeze. I've only toproped it. To toprope it, you will need a real long extendo runner, like 40ft, two 1" cams, and a #5 and #6 Wild Country cam. The 1" cams go directly behind the main maw in a low horizontal. You can also sling the acutal summit block/horn formed by the crack to back up these cams. The big cams go to skiers left and help to keep the toprope out of the crack. for even more Gallery pics of this route, go to the main Gallery and put "comfortably" into the search box. This route is in the shade all the time and can be quite chilly. 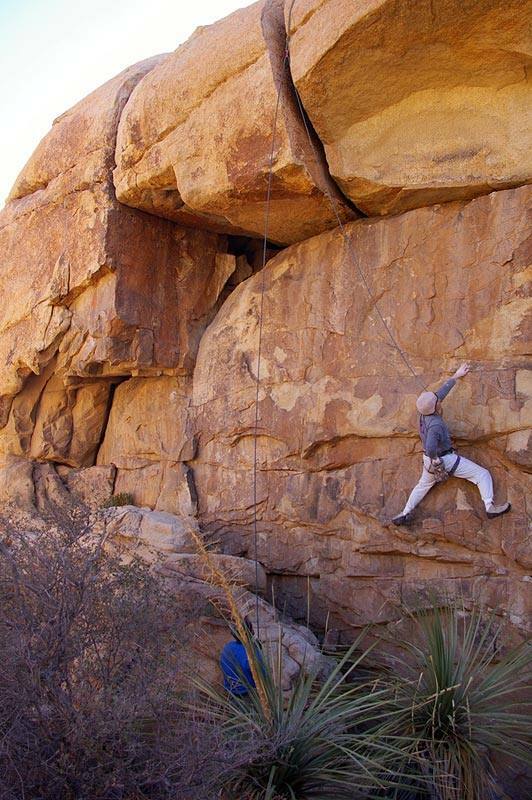 When starting up the face to get to the crack, stay to the right on the good holds as much as possible. The face climbing to the left is much harder. Once you are under the big summit block, there is a handrail type thing to get you over to the business. Directly under the crack is a fair to poor rest using some extra wide fists and a sandy jam or two. Be ready when you get there to just blast. The initial moves to get established in the crack are the probably crux. The key is getting your left leg shoved into the horizontal and having it stick long enough for you to either stack or armbar for a move or two. Your knee will go in the crack after only a couple of moves. From there it is just a standard grunt to make any progress. Left side in seems to be the ticket. There are a few face holds on each side of the crack and a pretty good edge rail inside the crack about half way up. Mountain Project info on the route. If you have any additional info, comments, or pictures of this route, click here to post them on the Forum.